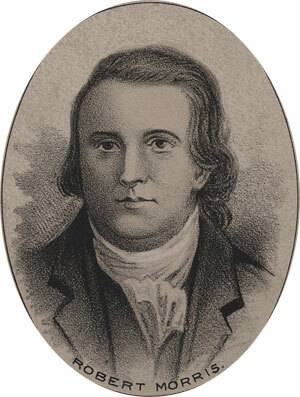 Born in England in 1734, he came to the Chesapeake Bay in 1744 and attended school in Philadelphia. Young Robert, who seemed ill suited to formal education and too quick for his teacher in any case, was soon apprenticed to the counting room of Charles Willing at the age of 16. Two years later his employer died and Morris entered a partnership with the gentleman’s son. In the succeeding thirty nine years that business flourished, and Robert Morris’ wealth and reputation were secured. Being an importer, the business was hit hard by the Stamp Act and the colonial revolt against it. Morris and his partner choose the side of the colonials and Robert engaged in the movements against British rule.